Armstrong produced a very large number of designs over the years. Many were supplied on an OEM basis and given a different brand name. These were bought by shipping lines, hotel chains, etc and give no sign who made them. Here I will just list a few examples of reviews dealing with items which Armstrong made and sold under their own name. I have included some quotes, scans, and in some cases added my own comments, opinions, and recollections. Note that all the magazines referred to below were United Kingdom publications unless otherwise specified. Armstrong were founded in 1932. 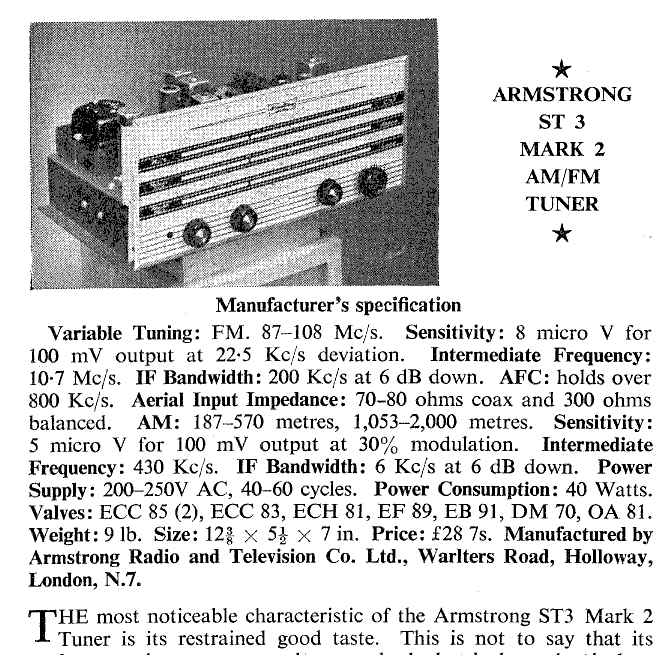 However this is the earliest review of an Armstrong product that I have been able to find so far. 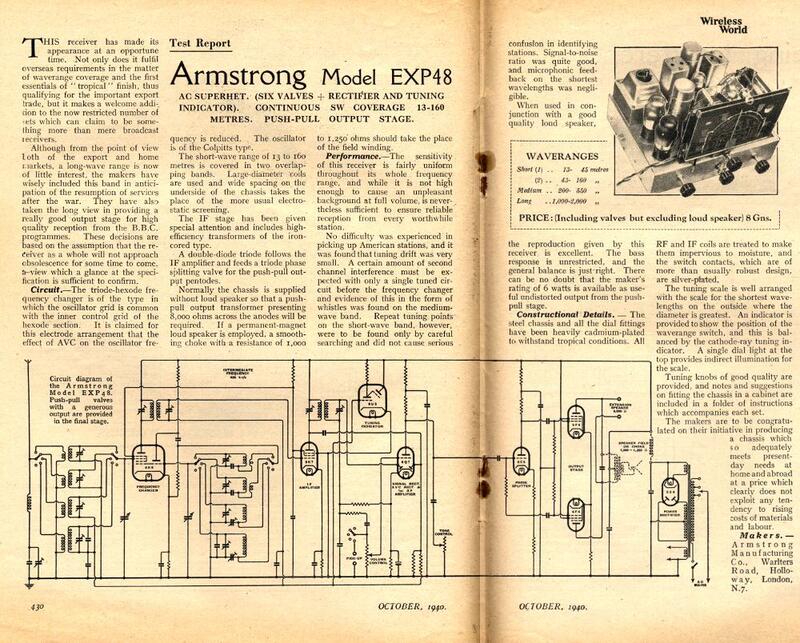 It appeared in the January 5th 1939 issue of Wireless World magazine. The AW125PP was an “All Wave” chassis. The tuner covered 5 bands ranging from 12·5 metres to 2000 metres. (Back then it was the norm to specify the wavelength rather than the carrier frequency.) So in modern terms the coverage was from about 150 kHz up to 24 MHz – i.e. the modern Long/Medium/Short waves. 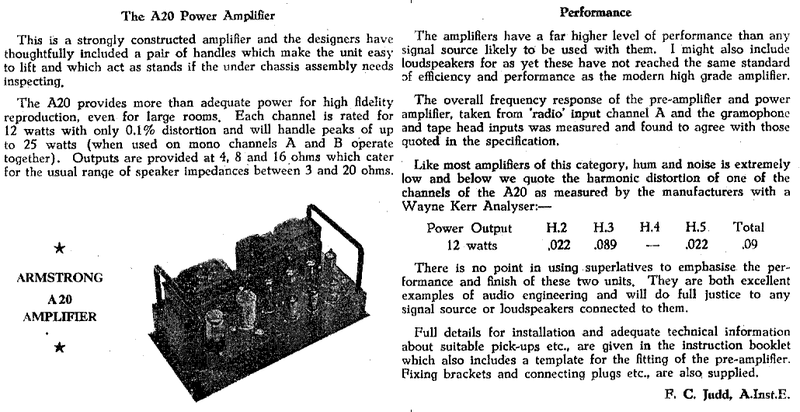 Back in the days before anyone had heard of the term “high fidelity” units like the AW125PP were regarded as superior-quality “radiogram chassis” models. The buyers were people seeking higher performance than that provided by mass-market radios and radiograms. The assumption was that the buyer would have the skill and enthusiasm to combine the AW125PP with a cabinet, speaker, and gramophone of their preference which they felt would give them the best results. The appearance of the EXP48 in 1940 is perhaps something of a surprise when we look back at the period. The United Kingdom had been at war for about a year, and from other accounts the availability of electronic equipment for civilian uses was being hampered by the war effort. However it looks like that – regardless of this – there was a “life goes on” spirit! “This receiver has made its appearance at an opportune time. Not only does it fulfil overseas requirements in the matter of waverange coverage and the first essentials of "tropical" finish, thus qualifying for the important export trade, but it makes a welcome addition to the now restricted number of sets which can claim to be something more than mere broadcast receivers. Today, it is usual for audio amplifiers to be designed to directly drive loudspeakers with typical impedances around 4 to 16 Ohms. And the established ’dynamic’ design for loudspeakers uses a strong permanent magnet to enable them to operate. But 75 years ago loudspeaker designs were rather more varied. Some loudspeakers used an electromagnetic coil to produce the required fixed magnetic field. This coil then had to be ‘energised’ by passing a steady current though it before the loudspeaker could work. Because of this it was common for amplifiers and sets to provide a direct current output for such a loudspeaker ‘field coil’. This being so, many manufacturers made double use of the coil and also employed it as a smoothing coil/resistor for the high tension (high voltage) supply provided to power the rest of the amplifier or radio set. The impedances of the available loudspeakers also varied a lot more than today. None of this mattered if someone went out and bought a complete radio or radiogram in a cabinet as a finished item. They would come ready-to-use as a single boxed unit with their own loudspeaker, etc, included. But the EXP48 was a ‘chassis’ model aimed at discerning users whose approach paralleled those today who collect and combine their own separate units to build a hi-fi ‘system’. Hence it was left to the user to choose the loudspeaker, and any matching transformer they judged would deliver the best results. In effect, the EXP48 is an example of the focus Armstrong had from the 1930s onward on the ‘enthusiast’ market. Buyers who wanted quality and were willing to assemble and combine items to get better sound. What we might these days call the “hi-fi separates market”. In our ‘internet age’ it may be worth saying that back in 1940 the BBC’s taste in entertainment tended to be rather staid and starchy. If you wanted to hear something like the latest jazz you needed to try and pick up broadcasts from elsewhere. So being able to ‘pull in’ such remote stations and obtain good sound from them was important. What isn’t clear now, however, is how many EXP48’s were actually made during the war. As this continued a number of adverts appeared in Wireless World and other magazines which made clear that components for building and repairing domestic radios were in very short supply. Armstrong’s factory was also engaged in building items for munitions. 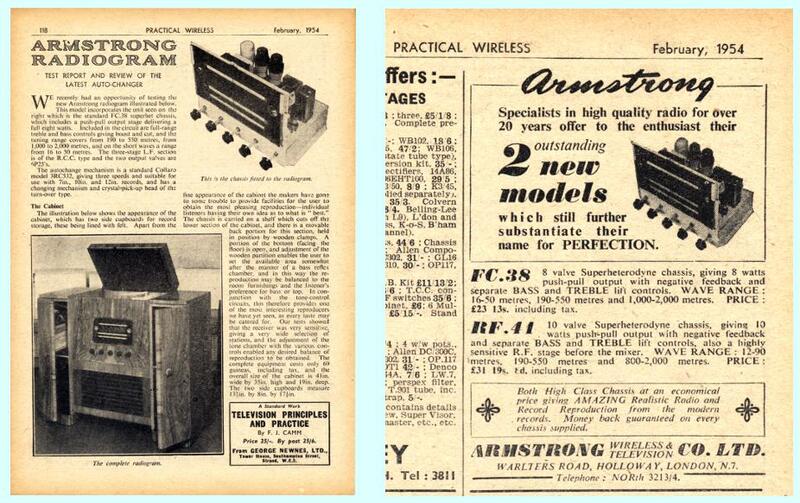 In addition to making and selling ‘chassis’ radios and radiograms Armstrong also occasionally arranged with other makers to sell complete radiograms. 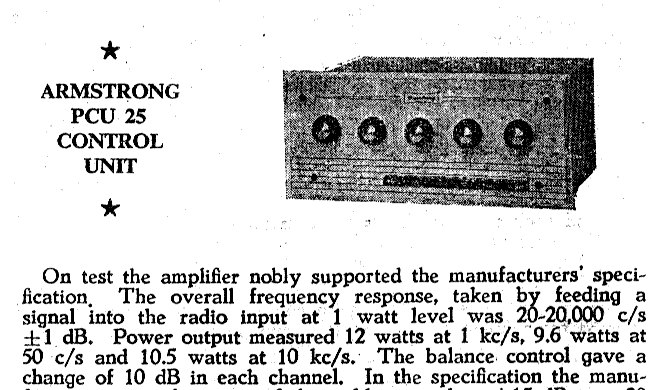 The FC38 reviewed by Practical Wireless in February 1954 is an example. The review dealt with the complete radiogram based on an FC38. Above also shows an advert in the same issue that Armstrong placed for those who might prefer to buy the FC38 chassis. “This model incorporates the unit seen on the right which is the standard FC.38 superhet chassis, which includes a push-pull output stage delivering a full eight watts. Included in the circuit are full-range treble and bass controls giving boost and cut, and the tuning range covers from 190 to 550 metres, from 1,000 to 2,000 metres, and on the short waves a range from 16 to 50 metres. The three-stage L.F. section is of the R.C.C. type and the two output valves are 6P25's. “A portion of the bottom (facing the floor) is open, and adjustment of the wooden partition enables the user to set the available area somewhat after the manner of a bass reflex chamber, and in this way the reproduction may be balanced to the room furnishings and the listener's preference for bass or top. In conjunction with the tone-control circuits, this therefore provides one of the most interesting reproducers we have yet seen, as every taste may be catered for. Our tests showed that the receiver was very sensitive, giving a very wide selection of stations, and the adjustment of the tone chamber with the various controls enabled any desired balance of reproduction to be obtained. It is perhaps worth noting that at the time it was usual to expect the buyer of a tuner to provide their own power supplies. In a similar way, pre-amplifiers often either took power from the power amplifier or a seperate power supply. The user was left to buy and connect all these items together as well as provide a cabinet. It was largely a DIY enthusiast process for the buyer. The reviewer complimented Armstrong on various aspects of the measured performance and sound. But did raise two specific concerns on the example of the ST3 which was provided. The wave change switch and its wiring were close to the bottom of the set. On the reviewers test bench this caused the wire/switch to touch the bench and shifted the switch slightly, causing the switch contacts to disconnect. As supplied the FM pre-emphasis was incorrect, but when the reviewer changed the relevant capacitor he was able to restore the correct response. The result was then flat to 0·5dB up to beyond 10 kHz. and he went on to make detailed measurements on aspects like the low distortion performance of the A20 stereo power amplifier. 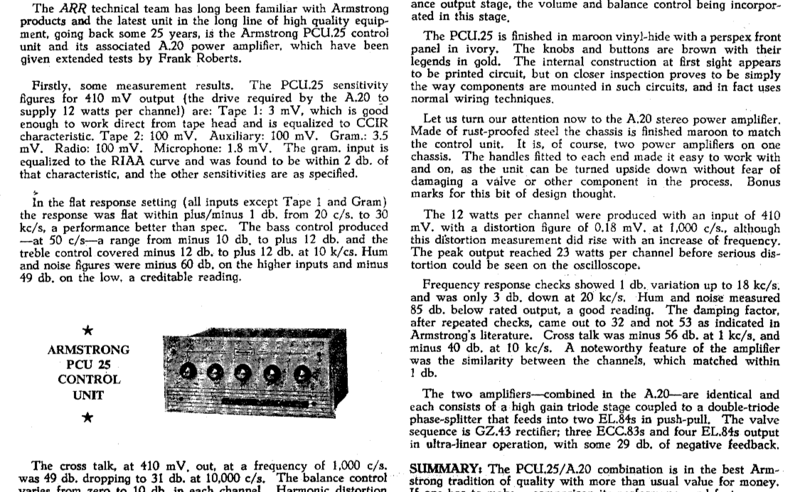 This review was one which Armstrong later reproduced in full in advertising literature for the PCU25 / A20 combination. “The importance of good styling cannot be over-emphasised, and as far as audio equipment is concerned a tuner or amplifier must look good as well as having a good specification from the engineering point of view. Unfortunately, few engineers have an aptitude or, rather, flair for external design (sometimes termed 'cosmetics') and many beautifully engineered products are spoilt by dull, unimaginative presentation. These comments probably illuminate what Armstrong had in mind when designing the 222! The 200 range represented a significant step in the evolution of Armstrong products. It had begun life in the 1930’s making valve radios and radiogram “chassis”. It establishing itself as a provider of high quality examples at prices enthusiasts could afford. During the 1940’s and 1950’s “High Fidelity” had slowly started to grow in Britain. But until around 1960 it had remained of interest only to a small minority who were usually technically literate with practical skills. They tended to want to make their own choices right down to matters like the choice of cabinet or casework. During the 1960’s a new and growing market emerged. Buyers who wanted good sound but simply wanted to buy a decently packaged set of units as consumer goods they could easily connect together and enjoy. This – along with the imminent arrival of transistors – was to change the market. Alongside the established PCU25 and A20 aimed at the more technical and demanding customers, Armstrong created the 200 range to suit this new market demand. One sign of this was the increasing focus on styling, careful ergonomic design, etc. Another was the growing assumption that buyers would want cased units rather than bare chassis. In line with this the A20 and PCU25 were given a restyling and continued to be sold as the 220 Power Amplifier and 225 Pre-amplifier units representing the “top of the range” amplifiers. In this review the reviewer was particularly interested in the details of the circuits used in the FM and AM tuners. At time FM Stereo was a new and ‘experimental’ introduction into broadcasting in Britain, and the 223 provided the option to add a plug-in stereo decoder. This approach became common at the time for various reasons. The decoder increased the price, and it was not settled at that time which stereo encoding system – if any! – would become the standard. 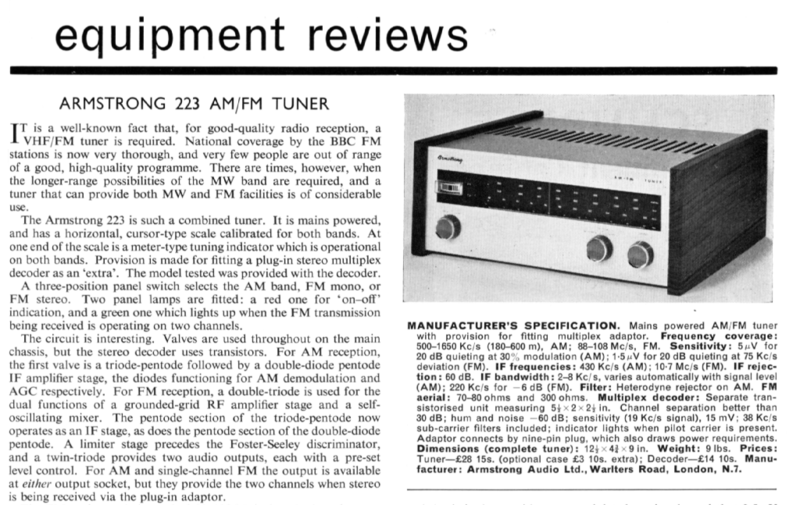 The reviewer was intrigued by a feature of the 223’s AM tuner. This was that the bandwidth of reception varied with the input RF signal strength. The 223 had been designed by Ted Rule, and I asked him about this some years later. He told me that he’d found this behaviour by accident and incorporated it as being very useful! In practice as the AM signal level rose the impedances of the amplification stages altered, changing the loading on the filters, adjusting the response in this beneficial way. It had become clear once the 222 was on sale that there was a demand for a similar unit that provided for the ‘magnetic’ cartridges. 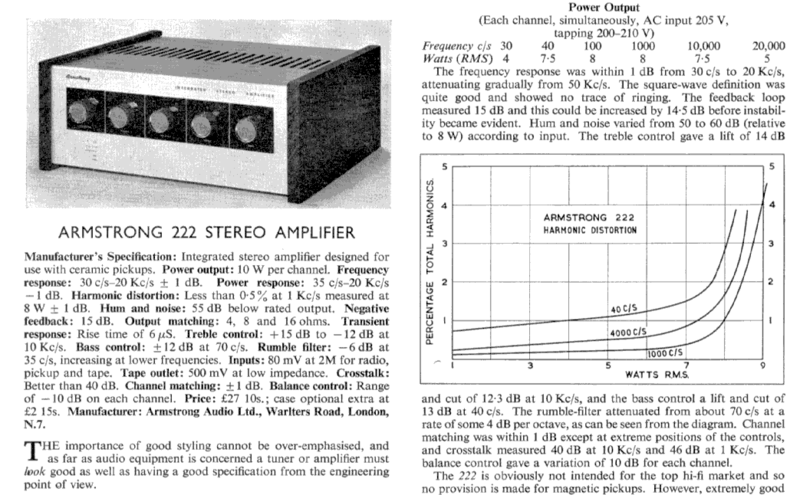 Hence the 221 was essentially a 222 to which a suitable preamp had been added. 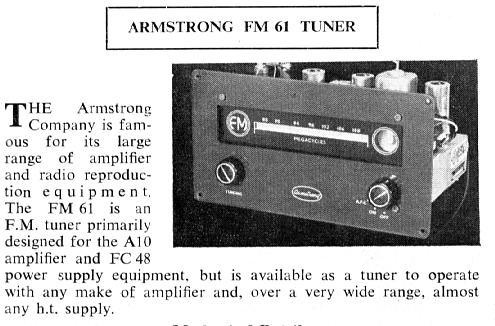 In terms of the history of Armstrong product developments the 221 is significant because it was their first model that employed transistors.